The NY/NJ Baykeeper’s Third Annual Oyster Benefit is April 21. Tickets are $150, but it’s a charitable deduction for a good cause and a fun time. If you can’t make that, on May 11, Wine & Spirits Magazine has their annual Top of the List event, which features some of the best new restaurants in the city and hundreds of wines and also happens to benefit Baykeeper. Tickets start at $85. If you’re into fresh, local seafood, you may have some trouble finding a CSF that still accepts members, but don’t worry as most greenmarkets have an East End fisherman selling whatever’s being caught. This year’s Sustainable Seafood Week NYC runs from June 22-28 – the list of participating restaurants and events hasn’t been announced yet, so check their website for updated info. The Manhattan Cocktail Classic takes place May 16-19 – tickets are available now. Governors Ball Music Festival is happening June 5-7 featuring Drake, Florence & The Machine, Bjork and The Black Keys. Tickets are on sale now. 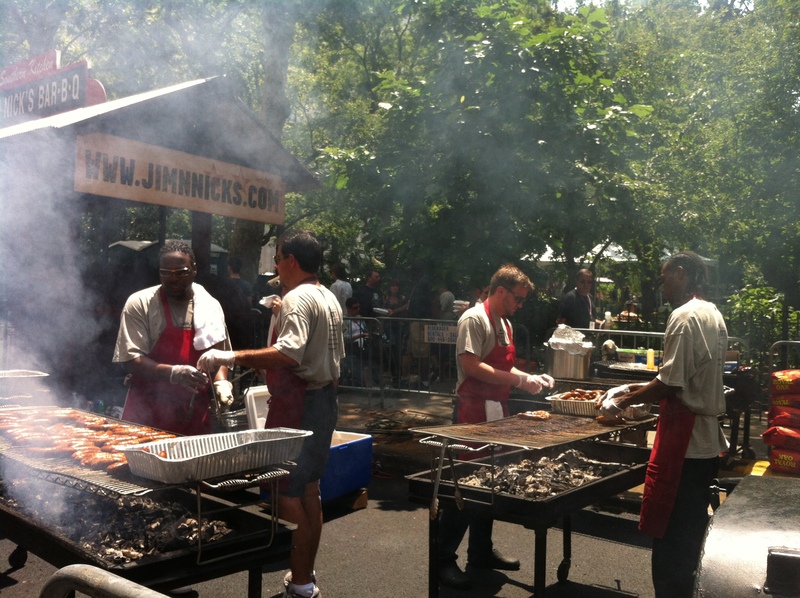 The following weekend you can attend the Big Apple BBQ Block Party (June 13-14) in Madison Square Park if you want to brave the lines. It also happens to be the 30th Anniversary of SummerStage. – and there are tons of events planned at parks across the 5 boroughs from May through October! I’m especially excited about the kickoff on May 18 with the Tedeschi Trucks Band. The schedule is still being worked out for the fall, but there’s something for everyone, with the summer featuring Big Daddy Kane, Dr. John, Beautiful (the Carole King musical) and the Metropolitan Opera, which is at Rumsey Playfield on June 15. Tickets are required for most events, but you can usually hear well just sitting on a rock outside. Philharmonic in the Park is my favorite summer activity. The 50th Anniversary this year brings a ticketed event at the Philharmonic (not sure why this makes sense as a celebration of an outdoor event) but the performances on the Great Lawn are scheduled for June 17 and 18 (usually it’s in July when it can be 100 degrees so let’s hope this helps). With plenty of space for everyone and fireworks after, there’s no reason to miss at least one of these fun nights. Check the website for performances in other city parks. Shakespeare in the Park is performing The Tempest from May 27-July 5 and Cymbeline July 23-August 23. Tickets are free if you can stand in line for the box office on the day of the event or you can try to win them in a lottery each morning. You can also purchase tickets by making a hefty donation of $200. If you have a car, there’s also the Balloon Festival, July 24-26 in Readington, NJ, which is great with kids or without. This year has music from Don Felder and Kansas, with additional acts yet to be announced. And last, but not least, here’s a reminder to sign up for your local CSA so you’ll be sure to have plenty of vegetables this summer.